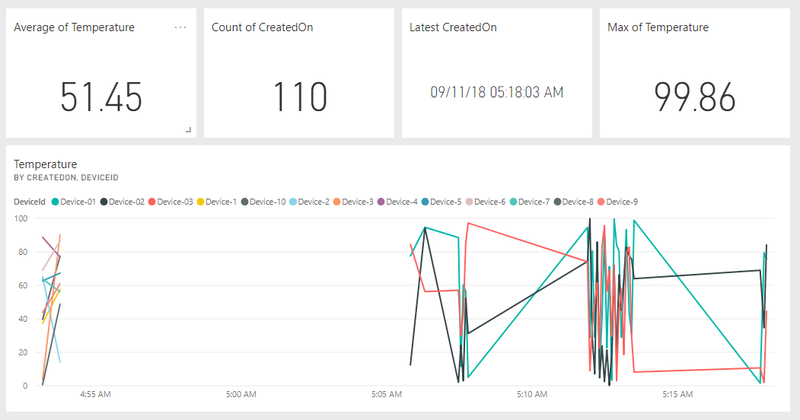 If you have got sensors which are emitting data and you want to visualize it in real-time, you can use PowerBI in conjunction with Azure Stream Analytics to build the dashboard. But if data is less frequent and you want to have a dashboards that auto-refreshes then you can use any one of three methods. In this post I will show how Push Datasets can be used to develop a dashboard. 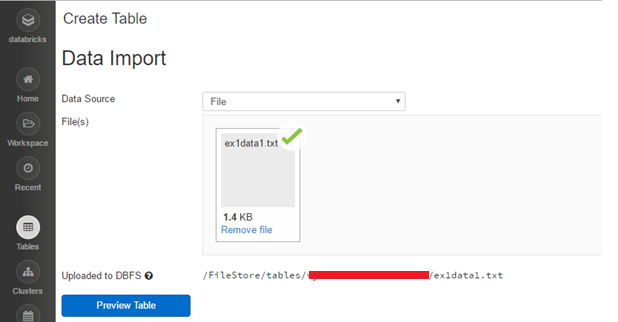 Data Generator (to simulate data is coming to db at every x interval). This could your source which generates data less frequently. The console application will be leveraging PowerBI REST API programming interface for pushing data. For this reason, console app needs to authenticate/authorize with PowerBI. So you need to register your console app with Azure AD in order to get OAuth token from Azure Authorization server. Please follow https://docs.microsoft.com/en-us/power-bi/developer/walkthrough-push-data-register-app-with-azure-ad to register your app. OAuth provides four different OAuth flows based how you want to authenticate/authorize your application with Authorization server. Please visit https://auth0.com/docs/api-auth/which-oauth-flow-to-use to know which flow is best suited for your scenario. I will be using Client Credential Flow (an OAuth flow which can be read at https://oauth.net/2/grant-types/client-credentials/ ) as console app will be treated as trusted application and also there would not be any human interaction if any authorization popup appears it would not be able to deal with. I treat this scenario as syncing two systems (from source to target but target is PowerBI). Most of the syncing solution, we need to maintain what we have synced so far so that next time system should pick delta of data. For this purpose, we are using ROWVERSION datatype which is auto generated by database. Please visit https://www.mssqltips.com/sqlservertip/4545/synchronizing-sql-server-data-using-rowversion/ for how to use rowversion for syncing scenario. For the first time, last row version should 0x000. Now, we got the data (delta amount), we need to send it to PushDataset in PowerBI. Every PushDataset has a unique id, and data needs to be sent to correct id. Now we got the Dataset Id as GUID, we need to use it to send data to Power BI. We will use PowerBI REST API to do this. You can do it in your console app to fetch all the datasets and grab the id for which you want to send to. For demonstration purpose I have shown you how you achieve it. Note that the dataset is listed as Push dataset. 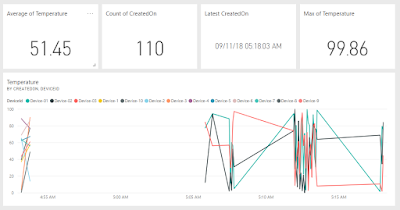 This blog is part 2 of Azure IoT Edge series. 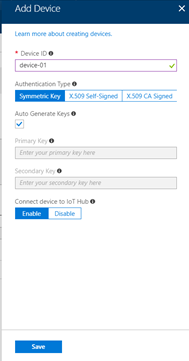 Please see http://blog.mmasood.com/2018/03/azure-iot-and-iot-edge-part-1.html if you have not read part 1. 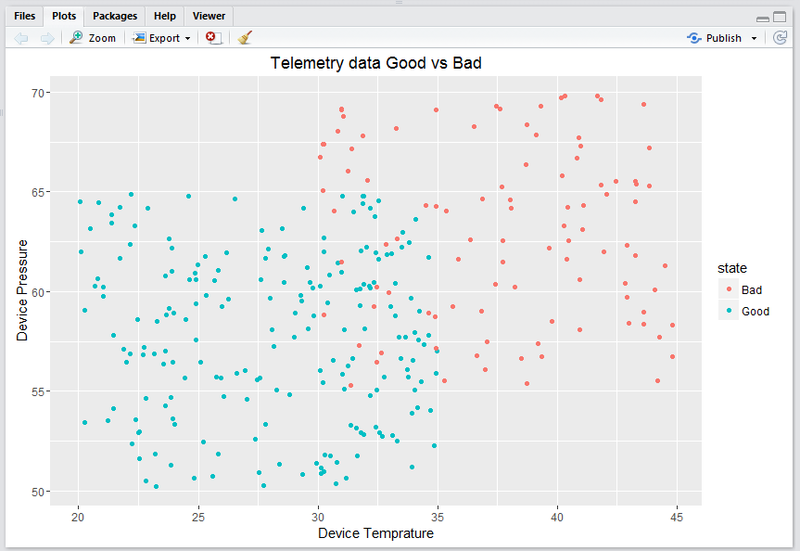 In this blog I will cover the how we can build a logistic regression model in R using the data the captured in tables storage via IoT Hub. We can run the simulated devices (all three at once) and wait for data to be generated and save it to table storage. 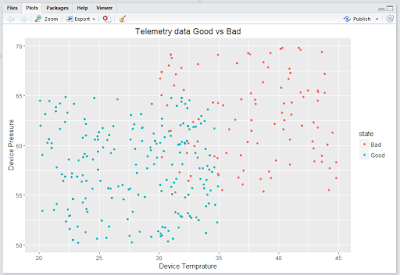 But for the simplicity I have created an R script to generate the data so that I can build the model and deploy it to IoT Edge and hence we can leverage the this Edge device to apply Machine Learning model on the data it is receiving from the downstream devices. I am using exactly the same minimum temperatures, pressure and humidity as our simulated device was using. Please see http://blog.mmasood.com/2018/03/azure-iot-and-iot-edge-part-1.html here are few lines of R script. We can see as the temperature and pressure increases the device is becoming bad or getting away from the good devices. For the simplicity the simulation generates higher number for temperature and pressure if device is flagged as defective. 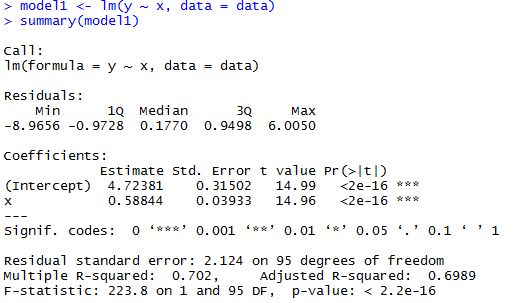 Now let’s build a simple logistic regression model to find out the probability of device being defective. The proportion of good vs bad for original data is: 66% (good)/33% (bad). So we make sure we don’t have skewness in the data. We can see from above output, the pressure is not statistically significant. The idea of this post is to have a model that we will be using in IoT Edge device. Let’s test this model on test data set and find out the best threshold to separate the bad from good. 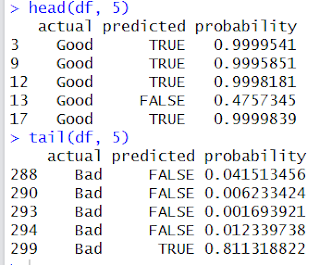 I could have used cross-validation to find the best threshold. 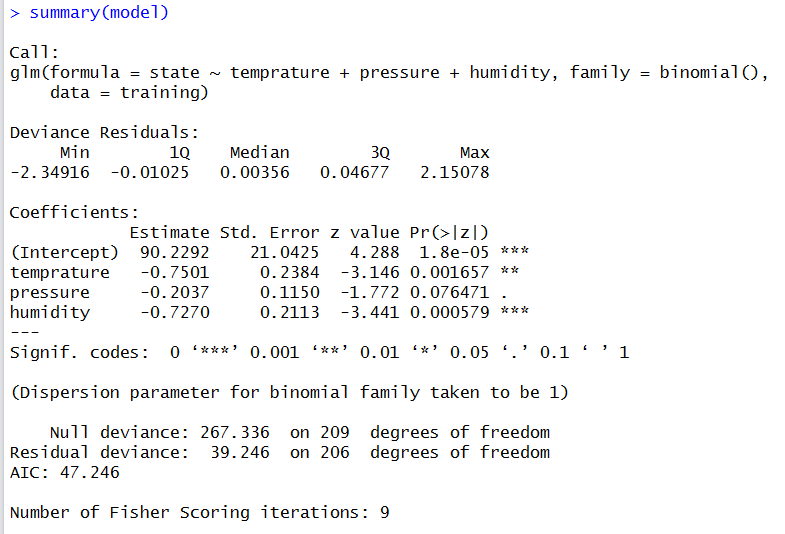 Use cross validation set to fine tune the parameters (eg. 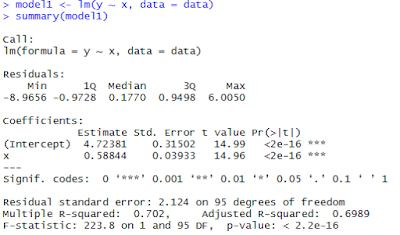 threshold or lambda if ridge regression is used etc). The higher (or closer to 1) the probability the device is good. 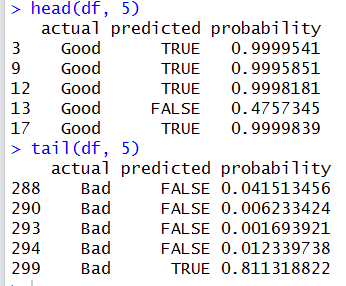 So we can see from above two confusion matrix, the best threshold should be 0.50 as it miss-classifies only 4 instances but when 0.65 is used it miss-classifies 5 instances. div align="left" class="MsoNormal"> In this exploration I will share what I have learnt so far R with Spark. Spark, as you all know, is a distributed computing framework. It allows you to program in Scala/python/Java and now in R for performing distributed computation. I implemented gradient descent in Hadoop to understand how we are going to parallelize gradient computation. Please have a read about it at http://blog.mmasood.com/2016/08/implementing-gradient-decent-algorithm.html for understanding mathematics behind it. How we are aggregating results from worker nodes. If your algorithm has to iterate over millions or more records then it is worth parallelizing it. Any computation you do, you will almost be doing same sort of things as I outlined above. I can use above high-level tasks mentioned above to build a complex Machine Learning model like ensembling models or model stacking etc. Please write in comments if you have other items than I have listed above J to learn from you as well. You need to sign-up at https://databricks.com/ first. Once you have done it you can follow it. Click on “Drop file or click here to upload” section and upload your file. Once you have uploaded the file it will show you the path. Note that path to somewhere. We now need to load the data. Remember that we are running R code in Spark so we need to use read.df (from SparkR package) to load data into a SparkDataFrame (not data.frame). You can see both are two different object. Now, I define a method that calculates partial gradient so that we can compute it on worker nodes and get the result back to driver program. We are caching (using cache(data)) data in memory so that in each iteration Spark does not need to load data from storage. We are performing some calculations (partial gradient) on each partition using dapply. So we are telling spark to run given function on each partition residing on worker nodes. Each worker nodes are getting a shared variable/object. In Spark-scala we had to broadcast the variable. We are collecting data from worker nodes as r data.frame object using collect method. Updating theta and that will be available to each worker in next iteration. We can validate our calculation on sample data so that we can debug it easily. 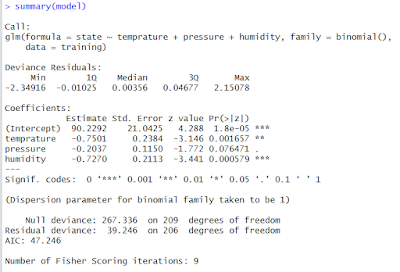 We can see that estimated coefficients are close to what lm model gave me. If we increase number of iterations we can get thetas close to it. I hope that this post will help you understanding SparkR. Please provide your feedback if I missed anything. In this post I will be exploring how can we use MapReduce to implement Gradient Descent algorithm in Hadoop for large scale data. As we know Hadoop is capable of handling peta-byte scale/size of the data. Gradient descent is a first-order iterative optimization algorithm. To find a local minimum of a function using gradient descent, one takes steps proportional to the negative of the gradient (or of the approximate gradient) of the function at the current point. 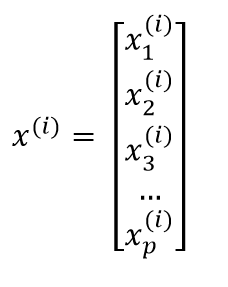 If instead one takes steps proportional to the positive of the gradient, one approaches a local maximum of that function; the procedure is then known as gradient ascent. If you look at the algorithm, it is an iterative optimisation algorithm. So if we are talking about millions of observations, then we need to iterate those millions of observations and adjust out parameter (theta). Now, the question is how can we leverage Hadoop to distribute the work load to minimize the cost function and find the theta parameter? MapReduce programming model comprises two phases. 1 Map, 2. Reduce shown in below picture. 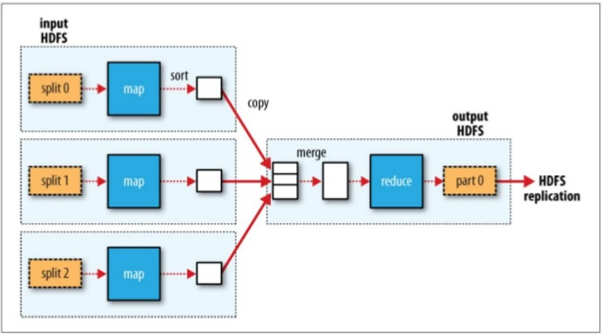 Hadoop gives programmer to only focus on map and reduce phase and rest of the workload is taken care by Hadoop. Programmers do not need to think how I am going to split data etc. Please visit https://en.wikipedia.org/wiki/MapReduce to know about MapReduce framework. When user uploads data to HDFS, the data are splited and saved in various data nodes. Now we know Hadoop will provide subset of data to each Mapper. So we can program our mapper to emit PartialGradientDescent serializable object. For instance if one split has 50 observations, then that mapper will return 50 partial gradient descent objects. One more thing, there is only ONE reducer in this example, so reducer will get whole lot of data, it would be better to introduce combiner so that reducer will get low number of PartialGradientDescent objects or you can apply in-memory combining design pattern for MapReduce which I will cover in next post. Now let’s get into java map reduce program. Before reading further it would be better you understand the Writable concept in Hadoop and some matrix algebra. We can see that map task is emitting partialGradientDescent object with lot of information. Like sum0, sum1 and 1. These information will be required in reducer to update the theta. We can see from Reducer code that we are summing up all given partial gradients. This can be improved if we supply combiner that does some partial sum before reaching to reducer. For instance if we have 50 mapper, then after each mapper the combiner will sum and send to reducer in that case reducer will get 50 partial gradient objects. and the last piece of the puzzle is the Driver program that trigger the Hadoop job based on number of iterations you need.